Safety first when winching! If you get hit by a broken winch hook or cable, it could ruin your day – or worse. Search YouTube for broken winch hook’s or line videos, and you will find more than you can watch in one day of people or equipment getting hurt or damaged. There are safe ways to perform recovery of vehicles, either your own or someone else’s. 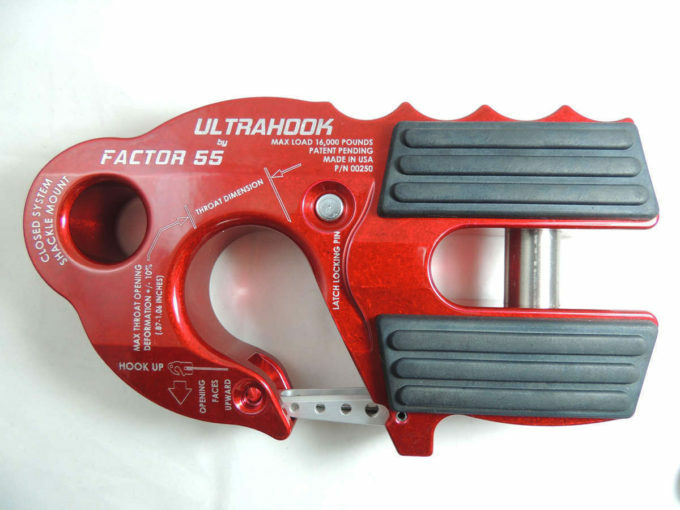 One of the safest tools we now have is the “Closed System Winching” with tools from Factor 55 (https://factor55.com/ ). We installed their FlatLink on our Warn Zeon 10S and synthetic line. Factor 55 has many options to choose from for your specific application. 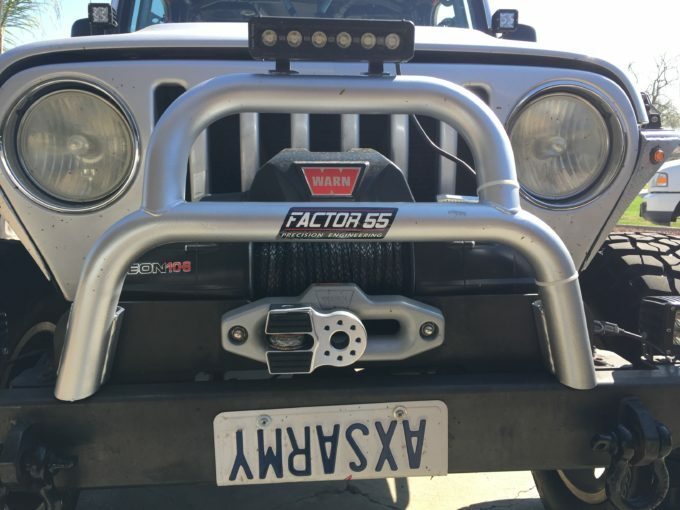 For our Jeep and installed winch, the FlatLink was our best option. 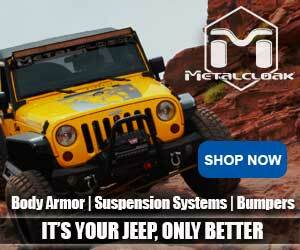 The FlatLink folds flat on the front of the Jeep and the fairlead when not being used. FlatLink folded flat, snug up against the fairlead. To install the FlatLink, we removed the safety hook that came with our Warn Zeon winch. The FlatLink has a C-clip to remove and then you can pull the pin. Be careful you don’t launch the c-clip across the yard or garage. We had no trouble installing the c-clip back into the FlatLink to hold the pin in place. 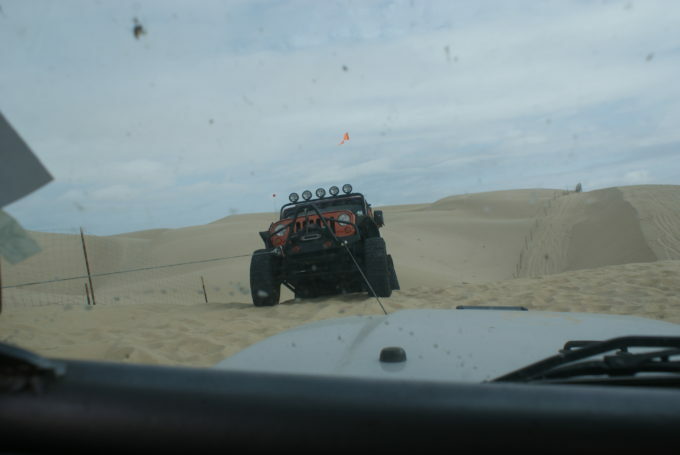 A few months after installation, we were at Pismo Dunes state park OHV area for the Jeep Beach West event. While out playing in the sand dunes with the group, our friend Eric got his Jeep stuck in a little sand draw. We pulled out one of our trusty D-rings, connected it to the FlatLink and spooled out our winch rope to help pull him the rest of the way up the sand hill. All of the other folks with us had not seen this type of application yet, and were amazed at how easy it was to be so safe in the recovery process. We have used our winch many times since then, and everyone likes the look and feel of the FlatLink with the added safety of the “Closed System Winching.” The use of a D-ring or soft shackle closes the system and keeps everything nice and neat while winching. It may take an extra minute to install your shackle, but safety has no time limit attached to it. Winching someone or yourself out of tough spot is one of the areas that has the most risk to us, our rig or the people standing around watching us. 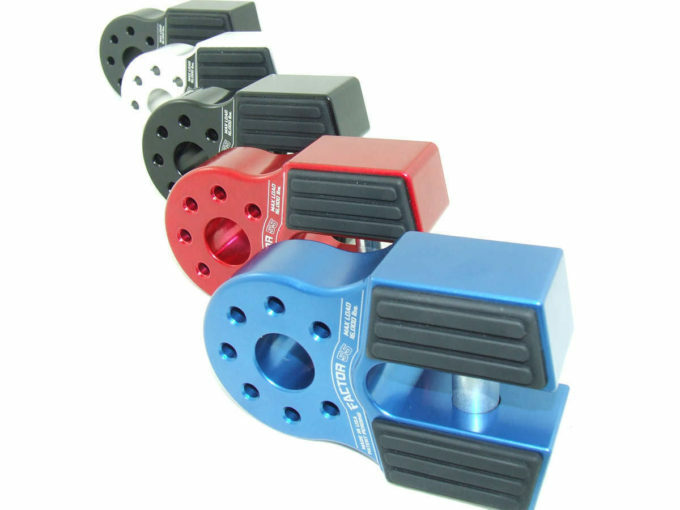 When we are out on a ModernJeeper Adventure, we will install a D-Ring or one of our new soft shackles on our FlatLink to speed things up in the field. You might not be able to get to all of your recovery gear quickly if it is needed so we carry a Warn recovery kit, and try to keep it handy while on the trail. Sometimes you get into a situation where you are not able to get to it quickly, so we leave somethings up front on the Jeep for easy access. What price do you put on our safety and recovery equipment? For me, spending more money on our safety equipment should be a no-brainer! In the industry where I work, we will spend extra on safety equipment because someone’s life could be in more danger if we cheap out on it. Don’t cheap out on this either for your rig and someone else’s safety around you. When your equipment says Factor 55, you know it is the best and safest available! Period. Factor 55 has other options if you don’t like the FlatLink. Options include the Prolink or the Ultrahook. You can check them out at the link above. The variety of options from Factor 55 is refreshing. Check out this short video of their primary products. Just a quick question. What is the best way to remove the existing hook from the winch line? My line is a 94 feet long synthetic. The hook was mounted through the eye of the line. Post a picture over on the forum. The hook on my Warn Zeon 10k had a pin with a keeper that was easy to remove. We can also reach out to Factor 55 to see what they would recommend for a removal process. Who made your current winch? Over on Facebook, I asked Justin on what is the best way to remove the old hook if it does not have a pin and cotter key like the one supplied with my Warn Zeon 10s. Harry, here is what I got from Justin at Factor 55. Yes sir. Cut off wheel and grinder. Cut the hook in 2 places and you’re done. 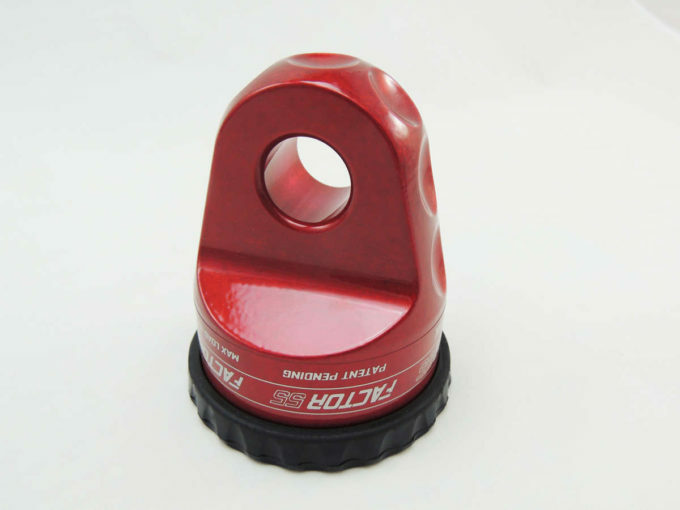 Or you can resplice the end of the line with our Fast Fid and use our Rope Spool to interface with FlatLink. A couple of videos also. I guess my question is, what makes this safer than the hook that came with the winch from the manufacturer? I get the added features and watching the embedded video I see some good features but did not see anything that talked about how this is so much safer.